Philippine National Bank Tokyo Branch / Nagoya Sub-Branch (“PNB Japan”) shall not be responsible for errors or delays in the domestic fund transfer or for inaccuracies in the instructions provided, or for any other consequences arising from causes beyond its control. Likewise, PNB Japan shall not be responsible for any consequential damages caused by errors or delays in transmission or non-transmission. Implementation of remittance shall be done in US Dollars or Philippine Peso depending on whether the beneficiary account is in US Dollar or Philippine Peso Door-to-door delivery in the Philippines will be in Philippine Peso only. Advise and Pay payments may be in Philippine Peso or US Dollar, however, US Dollar Advise and Pay payments are only available at selected PNB Branches. And Advise and Pay payments received through Pay-out Centers may be received in Philippine Peso only. The remittance proceeds shall be converted into Philippine Peso or US dollars by using the TTS rate quoted by PNB Japan on the date when remittance requested by the client is implemented. Note: Amount printed in your receipt for remittance to PNB on-line (rapid remit) accounts is already net of charges. Amount printed for non-PNB Peso accounts represent the amount to be forwarded to the other bank. The other bank may apply its own charges. The purpose of the client’s remittance is against the Japanese Foreign Exchange Regulations. War, civil commotion or similar occasions which will prevent PNB Japan to effect remittance to clients’ beneficiaries or block PNB Japan’s funds in the Philippines or in Japan. The remittance may possibly be subject to money laundering, which is mainly related to drug crimes, terrorism, etc. In these cases, PNB Japan shall not be liable for any loss on the client’s side due to PNB Japan’s non-remittance. PNB Japan shall at any time have its own option or discretion to remit client’s funds using its On-line Rapid-Remit System or through correspondent banks, etc. In the necessity of any contact with the client, address or telephone number in the client’s application is regarded as contact information. PNB Japan shall not be liable for any loss deriving from miscommunication due to the reason that the client’s written address or telephone number is incorrect. The Remitter Member Number should not be used by persons other than the legitimate holder. 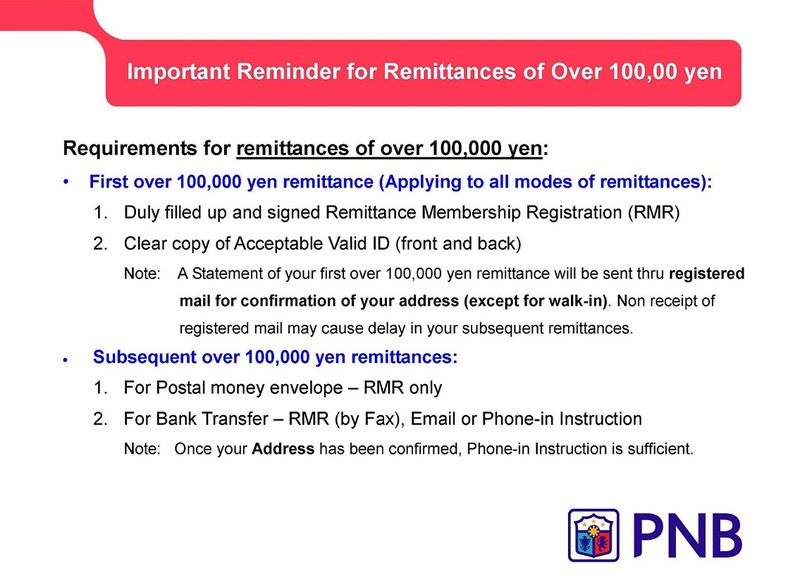 If abuse was revealed, PNB Japan reserves the right to suspend immediately all transactions with such Number. (i) State the purpose for remittance and any other required information in the Application for Remittance; (ii) State the designated items in the Application for Remittance (serve as Declaration Form) and submit it , except for cases such as when the funds of remittance are to be debited from the client’s account; (iii) Present the official documents to identify the client such as original/copy of the client’s certificate of residence, except for cases such as when the funds of remittance are to be debited from the client’s account; and (iv) For any transactions requiring Government permission or such, present or submit documents proving the said permission or such. In order to effect overseas remittance requests, part of the client’s personal information, such as the client’s name, address and account number (if applicable), shall be disclosed to the concerned paying/crediting bank as originator’s accurate and meaningful information. In order to maintain compliance with money laundering controls and laws PNB Japan may, at its sole discretion, request additional information pertaining to the source of funds, prior to the funds being sent. Failure to comply with this request may result in the client registration being either deactivated or cancelled and funds returned to the client. Failure of PNB Japan’s computer system under (within) the level that PNB Japan pays regular attention to its service, failure of telecommunication, failure of computer system, or garble or mistake or omission of the words due to failure of telecommunication. As the result of following the procedure prevailing in the pertinent country or the special instruction by the specific paying bank. Mistake in remittance details, e.g. beneficiary, account number, etc. by the client. Messages to be sent to the beneficiary. Legal dispute among remitter, beneficiary or a third party. Any other loss other than PNB Japan’s own clear mistake. If PNB Japan can determine that it can still be done, amendment or cancellation of an implemented remittance can be facilitated upon the client’s request. Amendment or cancellation cannot be done once the funds are already withdrawn by the beneficiary. This should be presented in the client’s written request duly signed by the client. PNB Japan shall require the client to present a valid ID to properly establish the client’s identification. On a case-to-case basis (subject to the amount, etc. ), PNB Japan shall require the client to submit a guarantor to confirm the client’s action. The client is requested to pay a follow-up fee of JPY2,500 per item. Follow-up fee may be subject to change. For amendment of remittance, original rate used will prevail. As for cancellation, yen equivalent using PNB Japan’s buying rate on the day the exact fund is received from concerned paying/crediting banks, less their charges will be the refund amount. Non-arrival of the client’s remittance: If the client determines that its remittance did not reach the beneficiary, please let PNB Japan know at the soonest so that PNB Japan shall trace immediately and inform the client of the result in due course. Matters not stipulated herein shall be governed by laws, regulations, customs and practices of Japan and other relevant countries and the procedures prescribed by the banks concerned. Designated Dispute Resolution Institution contracted with PNB Japan is Japanese Bankers Association. Contact point: Japanese Bankers Association Customer Relations Center Phone number: 0570-017109 or 03-52523772. Landing permission & stamp stating "Residence Card will be issued later"